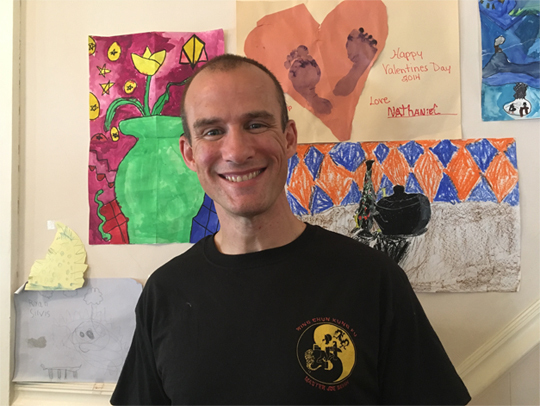 Jasper is a Level 5 assistant instructor at the Traditional Wing Chun Kung Fu Academy of Philadelphia under Sifu Seth Eisman, currently training for Level 7. He trained under Master Keith Mazza from 2002 – 2010. However, due to commitments to his growing family and increasing church leadership responsibilities, Jasper took a 6-year hiatus from training. In October 2016, Jasper rejoined the Traditional Wing Chun family at Sifu Seth Eisman’s school. He is now enjoying both training and teaching, as he assists Sifu Eisman with beginner and advanced adult classes. In September 2017, Jasper created the Children’s Traditional Wing Chun Academy of Philadelphia. The purpose of this academy is to help your child discover new abilities, develop inner strength, conquer life obstacles through perseverance and self-belief, and forge new possibilities through the training both mind and body. Jasper is excited to have the opportunity to guide your child along this journey with you. He believes in shared leadership between instructor and parent/guardian, cultivating trust and openness. Jasper is married and is raising 3 sons. He is a certified personal trainer, sports nutrition consultant, USA Track & Field level 1 coach, and professional life coach (a business he runs with his wife, Lara). Through his volunteering as a Sunday school teacher, Cub Scout leader, middle school assistant track coach, and youth soccer coach, Jasper remains current in all required Pennsylvania Child Protection Act clearances as shown in http://KeepKidsSafe.PA.gov/resources/clearances. These include the “Pennsylvania Child Abuse History Clearance”, “Pennsylvania State Police Criminal Record Check” and “Federal Bureau of Investigation Criminal Background Check”. These clearances are posted in the school and are updated as the state law requires. If you are interested in contacting Jasper regarding information about the Children’s Traditional Wing Chun Academy of Philadelphia, he can be reached at 610-864-2589 or by email at jaspersilvis@gmail.com.